Head trauma can occur in our pets! Head trauma/traumatic brain injuries can occur with motor vehicles altercations, hard objects (such as golf balls and baseballs) and even the tools used to hit the balls. Yes, it is true, sometimes animals can inadvertently, get hit in the head with a golf club or baseball bat! Sometimes, we see bites to the head from larger animals as well. These can be some of the more dangerous things that we run into when dealing with head trauma – because now, not only do we have a traumatic brain injury – but a possibly the introduction of an infection into the brain! Stabilization of your pet with head trauma is most critical at this point. Getting them to a hospital where a veterinarian can assess them and provide fluids and supportive care is ideal. However, ultimately, your pet’s prognosis will be dependent on his neurological examination. This should, ideally, be assessed by a Veterinary Neurologist. A veterinary neurologist is a veterinarian that has done 4-5 years of additional training after acquiring their veterinary degree. 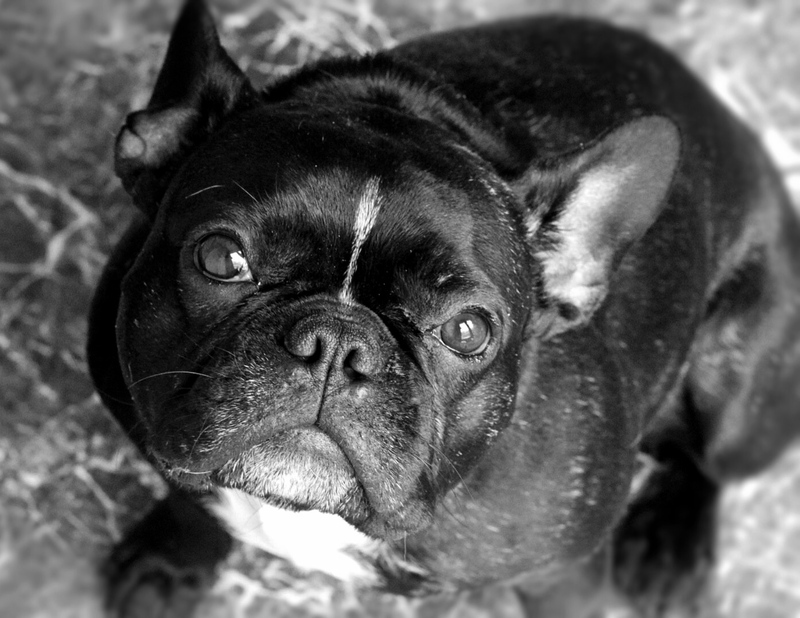 A Veterinary Neurologist will guide you as to what needs to be done to help give your pet the best possible outcome. Sometime, stabilization and time, is all that you need. 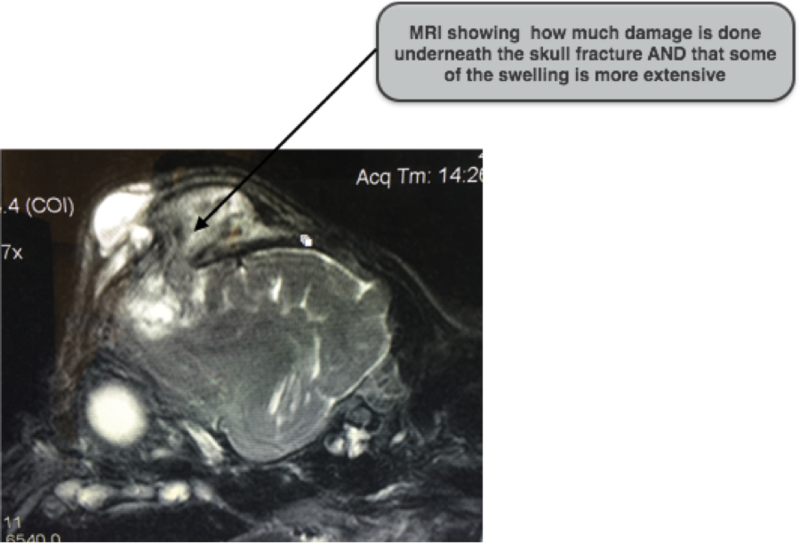 However, sometimes, advanced imaging is needed to help assess the damage and determine if treatment should be done. The advanced imaging should be done ONLY with the Neurologist because that is the doctor that will treat your pet. Anesthetizing a pet with head trauma/traumatic brain injury can be very risky and therefore, we try very hard not to anesthetize them needlessly. We can do CT or MRI to assess the extent of the damage. CT has always been thought of as the “right” test to do – however, CT only shows you the fractures (breaks in the bone) it won’t tell you if there is damage underneath in the brain tissue and if something more needs to be done to give your pet the best chance to do well long term. If your pet has had head trauma, they are at risk for developing future problems – such as meningitis and seizures. It is important that you find a veterinary neurologist to help care for your pet long term, so hopefully they can help prevent or manage additional problems that if they occur. 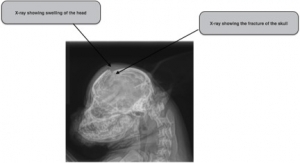 This is an x-ray (above) that shows a skull fracture (arrow on right) and some tissue swelling (arrow on left). X-rays as well as CTs are helpful in showing the bone – but as you can see – not very helpful in showing the soft tissue (brain) damage that may or may not be underneath! 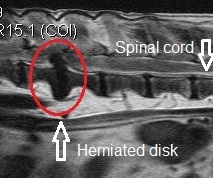 This is an MRI of the same dog (above) ! The MRI shows exactly what the swelling is that we are seeing and the extent of damage to the brain underneath the fracture. 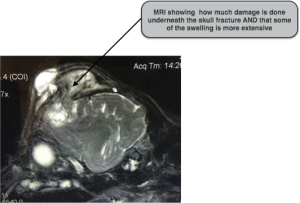 Sometimes, the MRI will show us that the problem is actually not near the fracture site – or if there are multiple fractures – which one has damage underneath. Treatments are based on clinical signs at the time of assessment. Anticonvulsants may be recommended if your pet has had seizures. Pain medication will likely be recommended to treat bone pain and head-aches. Antibiotics may be recommended if there is an indication that there is meningitis or an open wound from a dog bite! Additionally, hyperbaric oxygen therapy may recommended to help the underlying injury and help them improve to the greatest extent. Hyperbaric therapy is being used more and more in human medicine for traumatic brain injuries as well! If you have further questions, or if your pet has experienced head trauma or a traumatic brain injury, please do not hesitate to schedule a consultation with Dr. Kube. By Stephanie Kube, DVM, DACVIM|June 7th, 2015|Uncategorized|Comments Off on Head trauma and pets!